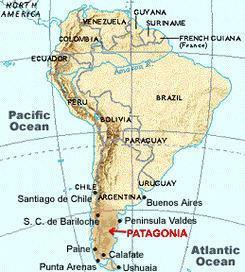 Patagonia is located in the south of the American continent stretching from the Atlantic to Pacific ocean through the Andes covering both Chile and Argentina. Patagonia still remains one of the wildest and most unspoiled regions of the world. A combination of boundless yellow scrubland, breathtaking mountain ranges, among them the famous Cerro Fitz Roy and Cerro Torre, mountain giants such as San Lorenzo or the Paine Massif, countless glaciers rolling down from the Patagonian icecap, huge lakes in every imaginable hue of green and blue, a very special fauna and, last not least, immense, isolated sheep farms (estancias). The intense colours, the crystalline purity of the air, the vast distances, rugged nature and of course the Patagonian wind leave every visitor with the strong feeling of "I must return to this place"… and we, the actual inhabitants of the place, are fascinated every day anew. We would like to introduce you to these manifold attractions and in doing so enable you to experience nature in a way that has become rare on our planet.